Good news, everyone! Triassic Life on Land may be the most comprehensive “go-to” resource for all your Triassic queries! Want to know where one might find Typothorax or Proganochelys? This book’s got the answer. Want to know the floral composition of Buntsandstein? Sues & Fraser have you covered. Ever wonder what kinds of bugs were around during the Early Triassic of Gondawana? You’ll find it in this book. This is an impressively researched, well-written, detailed study of the first third of the Mesozoic, and I suspect it will become the standard resource for studies involving said time period and the plants and animals that lived during that time. I especially liked the authors’ discussions about the various arguments that have cropped up around such colorful topics as subdivisions of the Triassic and how long they lasted, environmental conditions across Pangea, and extinction rates at the end of the era. The book is definitely at its best when it’s summarizing ongoing research: history lessons are always welcome. Unfortunately, the majority of the text is dominated by what’s essentially a faunal and floral list of the organisms one finds in the different Triassic-bearing rocks around the world. Now, this is doubtlessly valuable information, and I’m unbelievably happy to have it within reach, but this isn’t the kind of book you read before bed or while sittin' ‘round the fire. I did appreciate the fact that the authors briefly introduce most of the organisms featured in the Triassic with more than just an off-hand mention. You’ll learn things about the organisms themselves, although I suspect that if you’re the kind of person who’s excited about this book, you probably already have a pretty good idea what Drepanosaurus is, or why Erpetosuchus’ dentition is so strange. Happily, the book is filled to the brim with wonderful illustrations. These are largely skeletal restorations or illustrations of plants. Many of the archosaur illustrations are by Gregory S. Paul (a selling point! ), and most of the other illustrations are pulled from their respective original publications. There are no life restorations of animals or environments, which is a shame, and I expected at least a series of plates in the middle of the book—commonplace for this sort of tome—but none are present. The best illustration in the book, and the only one of its kind, is a B&W reproduction of a Douglas Henderson painting concerning a phytosaur (Smilosuchus) and several smaller, scampering crurotarsians. The picture sits at the front of the book and gives you some indication of things to come, but betrays your expectations a bit. I would have liked to have seen more paintings or drawings of the Triassic environment. This is partially my own neuroses: I have a hard time visualizing things from a description alone, especially extinct organisms. Triassic Life on Land goes to great length to describe the Coelophysis Quarry at Ghost Ranch and the animals and plants that lived there, for example, but an illustration would have really brought it home. When it comes to long-dead animals and plants, a picture is worth far more than one thousand words. My only other complaint is that the book just sort of ends. One second, the authors are talking about insect diversity going into the Jurassic, and the next second, we’re on the glossery. It’s sudden, and kind of jarring. There’s no “wrap-up” chapter, conclusion, or epilogue. The book just comes to a close without announcing that it’s doing so. In fact, the last three chapters of the book suggest that more could be written. The third-to-last chapter is a look at two particular Triassic environments and the organisms within (Solite Quarry and Madygen Formation). I’m not certain why these two formations were not covered in the other 90% of the book. They’re not especially noteworthy aside from documenting strange, controversial taxa (Longisquama, Scleromochlus). I don’t think they’re any more complete or illuminating than other places. At least, if they are, the authors don’t address how or why. Then there's a chapter about floral and faunal turnover during the entirety of the Triassic, which, if you'd been paying attention up until this point, you'd pretty much know. The last chapter is about the Triassic-Jurassic extinction and the various theories that attempt to explain it. It’s the most interesting chapter in the book, and what I found interesting is that the evidence isn’t particularly convincing for any one scenario. The press release made a big deal about how the Triassic is where modern ecosystems are set up, but information to that regard is surprisingly scarce in the book. One could probably write an entire volume about this concept and its implications, or at least a chapter, but there is very little of it overall--just touches here and there throughout the text. 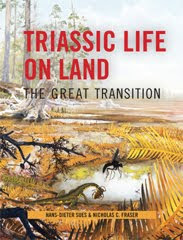 For the Triassic enthusiast out there, Triassic Life on Land is a very valuable, comprehensive, up-to-date reference book, providing quick access to a ton of Triassic information. However, I wouldn’t recommend the book to anyone else except maybe paleo-artists, who will swoon over the wealth of skeletal reconstructions offered in the book. There are some damn good dicynodont skeletons in particular, and even a few rhynchosaurs and aetosaurs. I would caution other readers, though: if you’re a casual paleontology fan or somebody who doesn’t care all that much about the Triassic, then the book is probably not for you. Like I said before, it’s very dry, and clearly a reference book. This is not bad—it’s great for a certain audience—but it’s by no means easy reading, and its subject matter is very specific. For its intended readership, though, this is a must-buy. Sues and Fraser actually put out a book a couple years ago on the Triassic that was filled with delightful Henderson illustrations (it was written for a more lay audience). You might look unto that one too as, in my opinion, they work quite well together (I like having reconstructions, too). looks like a great book for me to learn about the Triassic!